In my recent project, there are at least eight liquid storage tanks we need to design and purchase. Although, the design of storage tank is not part of my work (it is a job of mechanical engineers), but I always wonder how people design the tanks. In this post, I want to share to you the results of my desktop study about liquid storage tank selection. Fixed-roof tank is the least expensive to construct and is generally considered the minimum acceptable for storing volatile organic liquids. 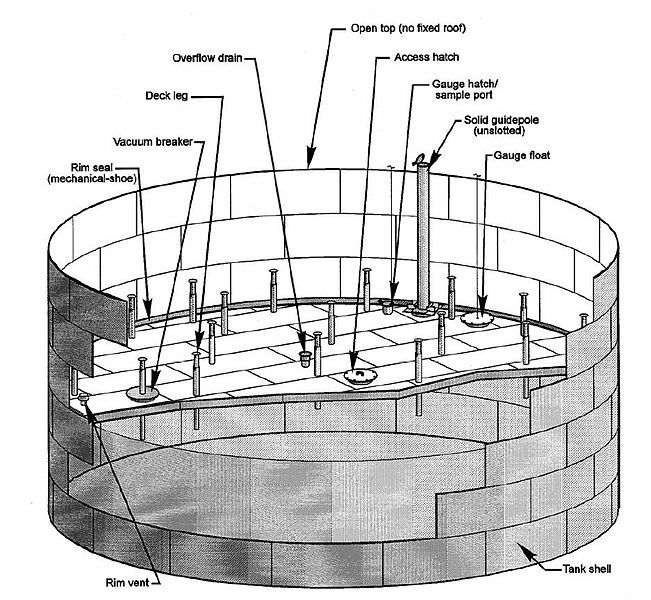 This type of tank consists of a cylindrical steel shell with a permanently affixed roof, which vary in design. Fixed-roof tanks are either freely vented or equipped with a pressure or vacuum vent. The latter prevents the release of vapors during very small changes in temperature, pressure, or liquid level. 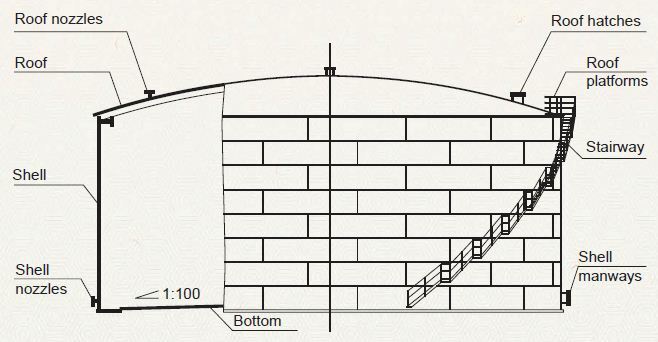 A typical external floating roof tank consists of an open- topped cylindrical steel shell equipped with a roof that floats on the surface of the stored liquid. The floating roof consists of a deck, fittings, and rim seal system. Floating decks that are currently in used are constructed of welded steel plate and are of two general types: pontoon or double-deck. An external floating roof tank is commonly used to store large quantities of petroleum products, such as crude oil or condensate. Unlike fixed-roof tank, there is no vapor space in the floating roof tank. 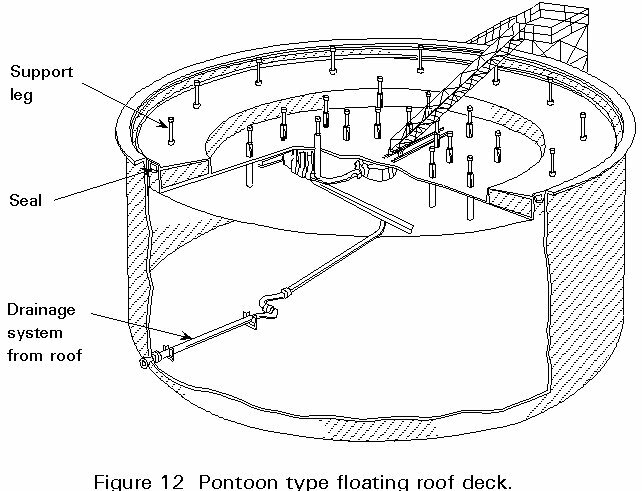 Domed external floating roof tank is typically an external floating roof tank that has been retrofit with a domed fixed roof. This type of tank is to an internal floating roof tank with a welded deck and a self supporting fixed roof. Internal floating roof tanks are used for liquids with low flash-points (i.e. gasoline, methanol). These tanks are cone roof tanks with a floating roof inside which travels up and down along with the liquid level. This floating roof traps the vapor from low flash-point fuels. Variables vapor space tanks are equipped with expandable vapor reservoirs to accomodate vapor volume fluctuations due to temperature and barometric pressure changes. The two most common type of varible vapor space tanks are lifter roof tanks and flexible diaphragm tanks. Two classes of pressure tanks are in general use: low pressure (2.5 to 15 psig) and high pressure (higher than 15 psig). Pressure tanks are generally used for storing organic liquids and gases with high vapour pressures, and are found in many sizes and shapes, depending on the operating pressure of the tank. Pressure tanks are equipped with a pressure/vacuum vent set to prevent venting loss from boiling and breathing loss from temperature or barometric pressure changes.